The greatest advantage of this system relies on its operating principle.The air is handled in a positive way. 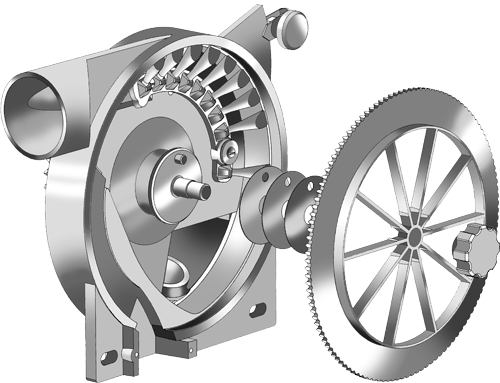 The air comes into the distributor case at a reduced speed of approximately 5 km/hour. The plate has cells with holes or slots to let the air out.The seed occupies a cell and tries to block the air outlet; in that narrowing place the air speed increases considerably at 18 km/hour. In this way, the seed remains midair and stays up in the cell. The advantage to be emphasized is that the seed is supported by a force proportional to its size; so, big or small seeds are held in the plate in a similar way. A levelling brush (adjustable from the exterior) brushes and expels the excess seed which might come in a compartment. Then an airflow lock (or felt) accompanies the seed that automatically travels to the exit point, free-falling –with zero initial velocity- in the same direction the planter is moving, going through the centre of the seeding tube without touching or bouncing off the walls; thus, the maximum precision planting at high speed is achieved. The planting plate does not touch any surface; it has neither outer nor front-end seals – on the contrary, it has between 0.20 and 0.30 mm clearance in its entire surface - that is why there is no wear in the plate. The advantage of these plates is that they never get clogged with grains or husks as they have compartments and grooves in their periphery; they are always clean; the air goes out from the interior of the distributor so no dust is absorbed, which may wear off gears and/or locks). The key point is to handle the air in a positive way. All the advantages of the system are based on the handling of air in a positive way. Blowing is more economical than sucking. Examples of daily life show us that using pressure in a positive way is more efficient: water-pressure washing, air blowers, hydraulic pressure in tractors, irrigation system for crops, injection pump, air brakes systems in trucks, etc.